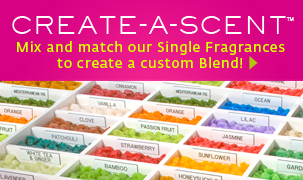 Create-a-Scent is an online version of our unique blending table available exclusively at Scentchips. Simply select two to four fragrances to create your own custom blend. Over 30,000 Create-a-Scent combinations! For blending inspiration, download our PDF Recipe Guide.